Many people use the word “fuschite” for this material. That is a misspelling. Fuchsite: Photograph of a verdite specimen consisting almost exclusively of fuchsite platelets with a foliated texture. Specimen is approximately 2 inches across. Muscovite begins to take on a very light green color with the substitution of a small amount of chromium for aluminum. As the amount of chromium increases, the green color becomes stronger and ranges to a rich emerald green when abundant chromium is present. The chemical formulae of muscovite and fuchsite are shown in the table. Uses Fuchsite of good purity is not abundant enough to support manufactured products. The primary use is as a gem material, especially ruby in fuchsite for cabochons, spheres, and small utility objects that will not be subjected to impact or wear. 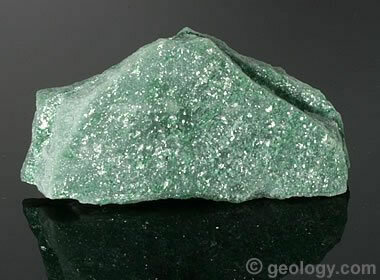 Fuchsite is one of the most commonly misspelled minerals - especially in the lapidary market. It is often spelled (and pronounced) “fuschite” with a long “u” and a long “i”. 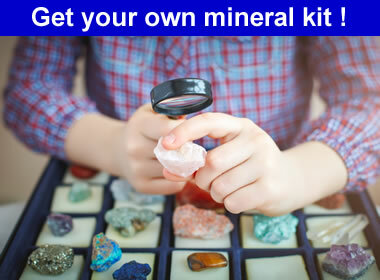 The material is named after Johann Nepomuk von Fuchs, a German chemist and mineralogist. His name is pronounced “fooks” - similar to the way you pronounce “books” and “looks.” You can hear a pronunciation here. 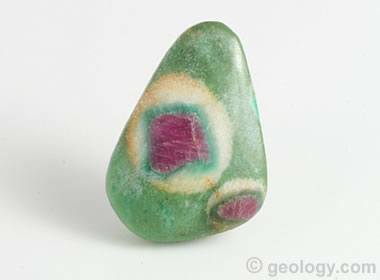 Ruby in Fuchsite: Photo of a ruby-in-fuchsite cabochon with a rim of blue kyanite around the red ruby crystal. This blue kyanite rim is diagnostic of ruby in fuchsite and can be used to avoid misidentification as ruby in zoisite. Cabochon is about 1 inch in height. Verdite is usually soft and fragile; however, some competent specimens can be cut into cabochons and polished to a very high luster. Some people who cut verdite stabilize it for cutting by gluing it to a backing. Thin slices of black obsidian, basalt, or another black material are often used as backing. Verdite is typically a foliated rock, with the mica grains oriented with their flat faces perpendicular to the direction of compression. The most attractive orientation of verdite when cutting cabochons is with the mica flakes aligned parallel to the bottom of the cab. Then, when the dome on the cabochon is cut and polished, the mica flakes reflect light and produce a green aventurescence. 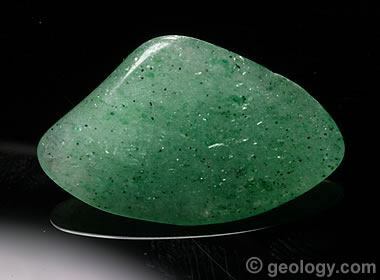 Green Aventurine: Photo of green aventurine as a tumble-polished stone. In this photo you can see the green mica flakes suspended in the quartz. Sometimes small platelets of fuchsite or other green micas are suspended in quartz to produce the gem known as green aventurine. It has become a very popular and typically inexpensive gem material that is cut into cabochons, beads, and small sculptures. It is also very popular as tumbled stones. Green aventurine is much more frequently seen as a gem material than verdite, fuchsite, and ruby in fuchsite combined. See tumbled stone photo. 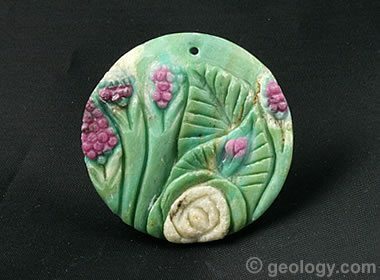 Carved Ruby in Fuchsite: A pendant carved from ruby in fuchsite in which the artist took advantage of the red rubies to produce flowers. Blue kyanite alteration rims can be seen around the rubies. What is “Ruby in Fuchsite”? Occasionally, corundum crystals are found in fuchsite. When these corundum crystals are of a bright red color, the material is known as ruby in fuchsite. This material attracts a lot of attention at rock, mineral, gem, and lapidary shows because of the contrasting colors of the fuchsite and ruby, and because the corundum crystals often exhibit spectacular hexagonal shapes when cut in slabs, cabochons, spheres, and other objects. 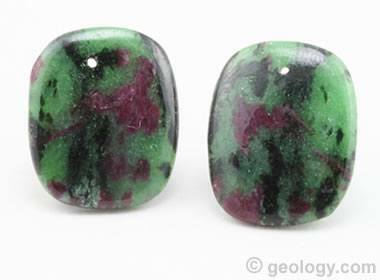 Ruby-in-Zoisite Cabochons: Two ruby-in-zoisite cabochons. Note that they do not show blue kyanite alteration rims around the ruby. The material also has the characteristic scatter of black hornblende crystals. If spelling and pronunciation problems were not enough, ruby in fuchsite is one of the most commonly misidentified gem materials. If you visit lapidary shows and online auctions, you will probably see ruby in fuchsite more often presented incorrectly as “ruby in zoisite” than as "ruby in fuchsite." This identification problem can easily be solved if a person learns the three facts below and uses them for identification. 1) Fuchsite has a hardness of 2 to 3, while zoisite has a hardness of at least 6. 2) Rubies have blue kyanite alteration rims in fuchsite but no alteration rims in zoisite. See the cabochon photos. 3) Ruby in zoisite is usually marked with a scattering of black hornblende crystals. The next time you are at a rock, gem, or mineral show, watch for green and red cabochons or carvings. If you see blue alteration rims, it is probably ruby in fuchsite.